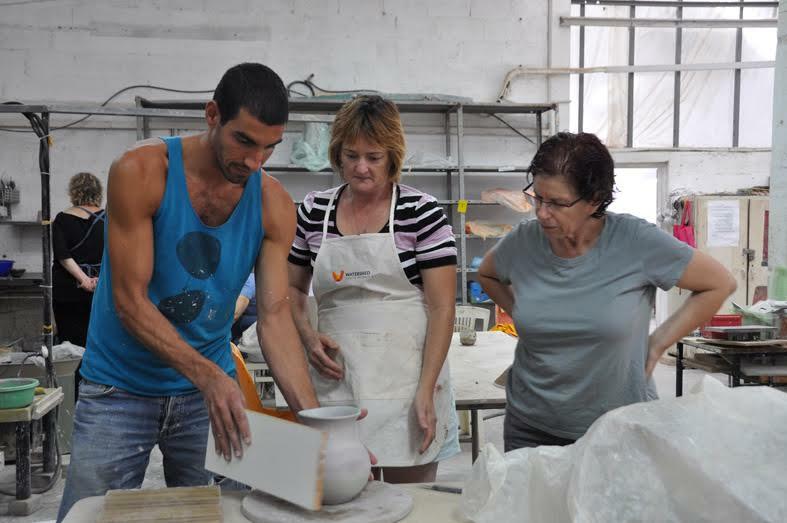 AIDASHED is a unique residency exchange program between the Association of Israel’s Decorative Arts (AIDA), Givat Haviva and Watershed. AIDA seeks to foster the development of contemporary decorative artists from Israel by connecting them with an international audience of galleries, institutions and collectors. In 2005, AIDA and Watershed first collaborated to bring a group of ceramic artists from Israel to Maine for a residency at Watershed. AIDA invited four artists from Israel and Watershed invited four artists from the US, creating a dynamic residency group. The success of this program led to an expanded opportunity known as AIDASHED: a Watershed-like two-week residency experience held in Israel. To date, artists have participated in three such residencies at The Art Center at Givat Haviva Institute in 2010, 2012, and 2015. Participating American artists have enjoyed the chance to share in this experience, forming personal friendships and professional networks that strengthen the international community of ceramic artists. Givat Haviva is a nonprofit organization that promotes mutual responsibility, civic equality and cooperation between divided groups in Israel as the foundation for building a shared future and society. Its Center boasts vibrant, large, well-equipped premises for studying ceramics and creating with clay.